When the body is functioning as it should, wounds repair themselves naturally. Sometimes, however, wounds do not heal, due to conditions such as diabetes or other chronic diseases. This puts the patient at risk of infection and other complications, at worst even requiring amputation. Chronic wounds affect 37 million patients around the world, and there is a great need for better treatment of these wounds. In her Master’s Degree thesis, Politecnico di Torino student Viola Sgarminato discusses how 3D bioprinting and electrospinning can create scaffolds that actually promote wound repair. Using a combination of electrospinning and 3D printing with an EnvisionTEC 3D-Bioplotter, Sgarminato developed scaffolds that would promote healing by electrically stimulating skin cells. “To this aim hierarchical scaffolds of polycaprolactone (PCL) and piezoelectric barium titanate (BaTiO3) nanoparticles were fabricated using 3D-bioprinting and the electrospinning technique,” Sgarminato explains. Electrospinning is a technique that has been used for decades, and it involves the use of an electric charge to spin nanometer threads from a polymer solution. 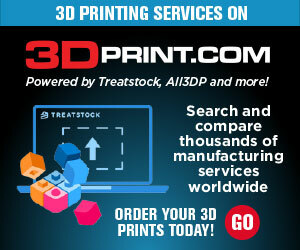 Lately, it’s been frequently used in conjunction with 3D printing, particularly bioprinting. In one part of the study, Sgarminato used the technique to create fibrous patches. She also used a 3D-Bioplotter to 3D print scaffolds for skin regeneration. The scaffolds were seeded with cells, which were then evaluated 24 and 72 hours later. For the electrospinning portion of the project, one solution, in particular, worked better at producing defect-free mats of fibers – PCL was the key ingredient. The 3D printed scaffolds were examined to test their porosity, and to compare those that were produced through high temperature and low-temperature 3D printing. The composite wound dressings were also examined using a scanning electron microscope to verify the adhesion of the fibers to the scaffold, and good results were shown: even if subjected to mechanical stretching, the fibers remained attached to the substrate. SEM images of electrospun fibers deposited onto a composite scaffold. You can read the full thesis, entitled “Composite scaffolds with porosity over multiple length scale for skin regeneration,” here. The paper demonstrates that electrospinning and 3D bioprinting are effective methods of creating wound dressings that can treat chronic wounds and promote healing. This is an important application of bioprinting; while many people excitedly await the day that it’s possible to 3D print and transplant working human organs, it’s applications like these that are more immediate and can save lives just as effectively as a new heart.